This little guy loves exploring outside! If he could stay outside and play all day, he would! With the weather starting to change here now, I've been trying to round up some new activities for him to enjoy indoors during the winter months, when won't be able to spend as much time outside. 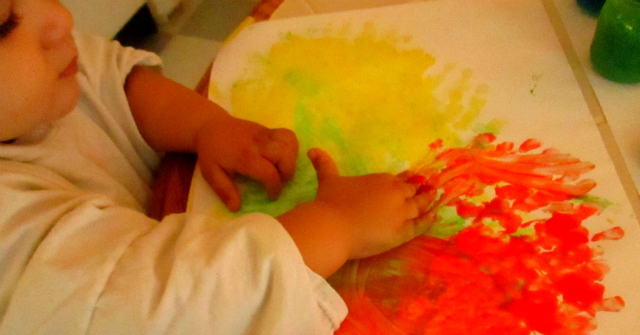 We've been experimenting with crayons and paint over the past few days, and I've learned (or re-learned) a thing or two about art and toddlers. Mainly, they love to taste test, and there's not a ton that's off limits! He's 20 months old now, and while he's getting a bit better about putting things in his mouth, he's still definitely in the stage of giving new things a quick taste. 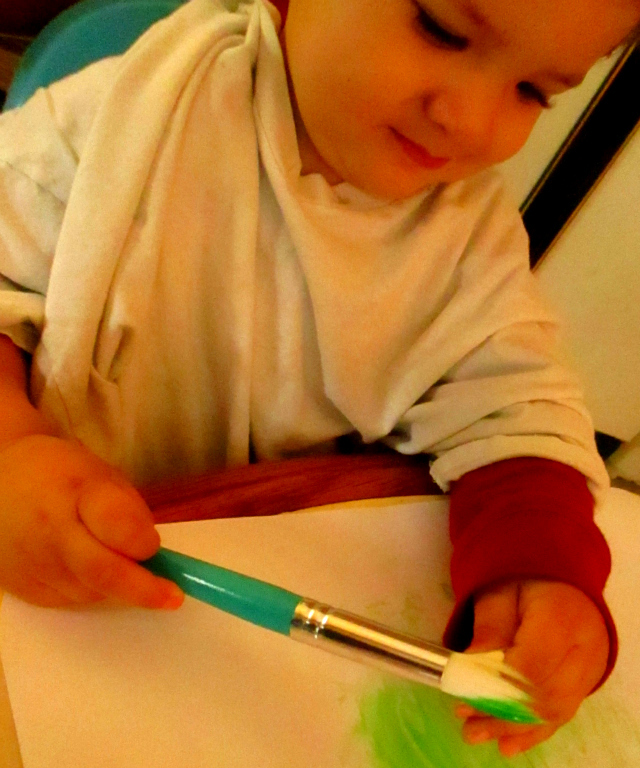 After watching him try to devour the end of a crayon, I took to the internet to try and find safe/non-toxic art supply options, just to be on the safe side. Much of the product ingredient lists still had me leery, so I decided to try and make some homemade toddler safe art supplies instead. 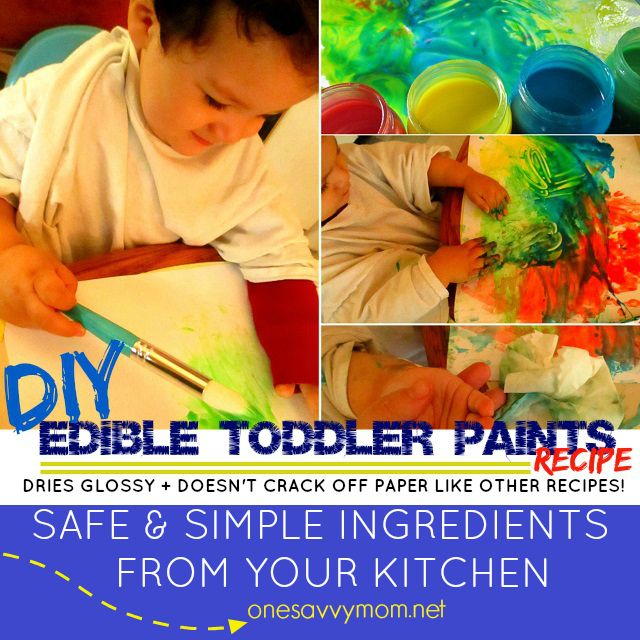 I started with toddler safe edible finger paint. I tried 2 recipes that I found online, only to discover that they cracked off of the paper as soon as they dried. After some more experimenting in the kitchen, I found the recipe below for Edible Toddler Paint / Finger Paint to be the very best! It dries bright and glossy, it doesn't crack one bit after it dries, and it doesn't dye little fingers, or surfaces. It simply wipes clean with a baby wipe or wet cloth! Mix gel food coloring with 1/4 cup of sweetened condensed milk. 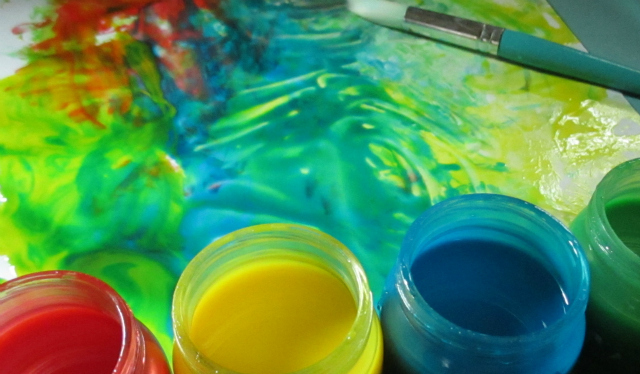 Make primary colors or play with the gel food coloring to achieve additional desired colors. Repeat the above step with 1/4 cup sweetened condensed milk + gel food coloring to mix each of your paint colors. Affix a large piece of paint paper or butcher paper to your covered surface using washi tape, to hold it in place for your little artist. 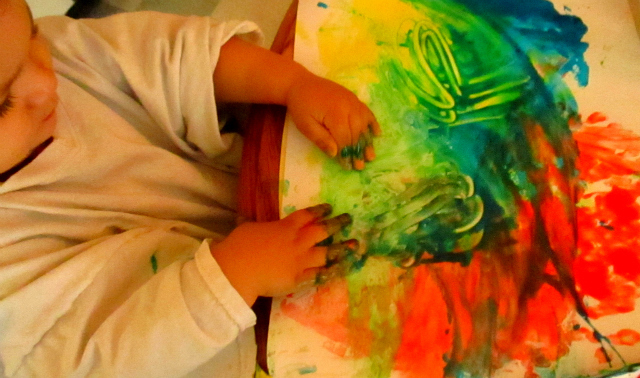 Next, paint using large bristled brushes, or let your little one finger paint. Store the edible paints / finger-paints in air-tight containers (such as upcycled baby food jars or plastic containers with lids) in the refrigerator. (NOTE: paints MUST be stored in the refrigerator or they will go bad). Hang / place your completed paintings in a sunny / warm place to dry. The paint typically takes about an hour to dry completely. 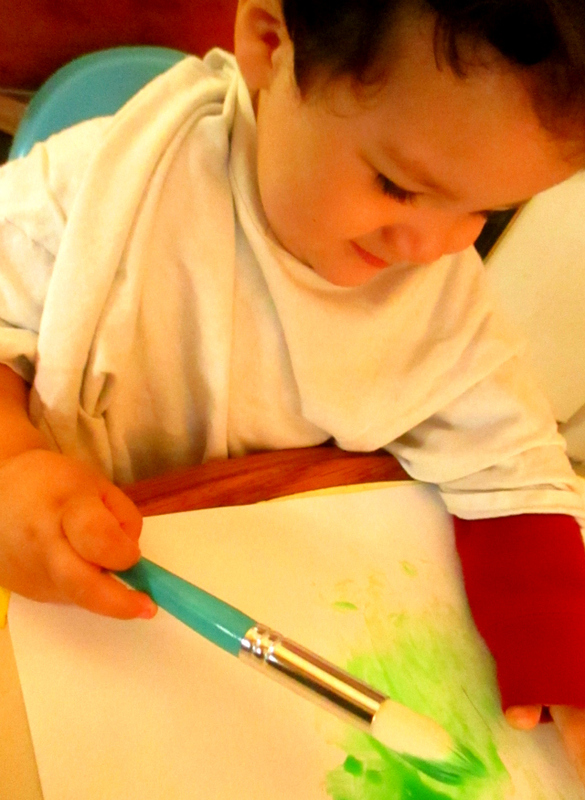 Our little guy loves painting with these edible paints, and I love that even if he takes a little taste they're completely safe! I also love that unlike other food dye / food coloring (and even some supposed "washable paints" on the market) these Gel food colors used to color the paint doesn't dye/stain skin. 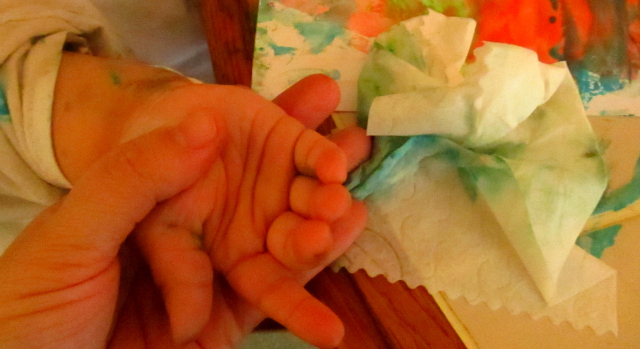 They easily wiped clean from my little guy's hands and my table with a baby wipe. My little guy LOVES to pain. I have to try this because I'm always worried about him putting paint into his mouth while painting. It's a great recipe for little taste-testers :) Let me know how you like it, if you do try it. It's been our best bet so far. Have a great holiday! Wow - this is the first time I ever heard of making edible paint from sweetened condensed milk - what a great idea!